Pick up the phone, send us an email or simply fill out our form and we’ll get back to you as soon as possible. 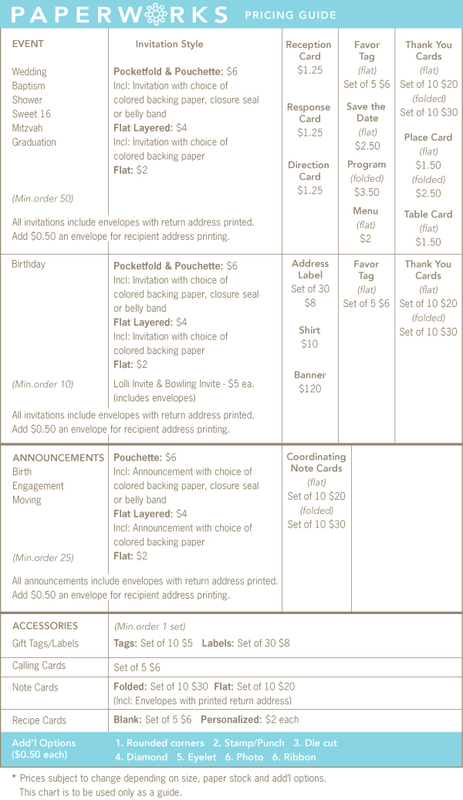 Pricing varies depending on quantity, paper stock, and additional printing. We have a general price guide as a downloadable pdf for some of our items. There are also optional costs which can be incorporated if you choose. If you have a budget in mind that you would like to stick to, let us know and we’ll try to meet your needs. Shipping will be calculated at the end of your order. We only ship within the United States. Samples and final proofs are sent first class USPS mail. All other orders are shipped via UPS Ground. USPS Priority mail is available upon request. We accept cash or check as payment. We are required by law to collect sales tax of 7.0% for orders that are shipped or delivered to destinations within the state of New Jersey. Orders shipped outside of New Jersey are exempt from New Jersey state sales tax. If you live near the Flemington area, we can also arrange a pickup time or place to make it convenient for our customers.